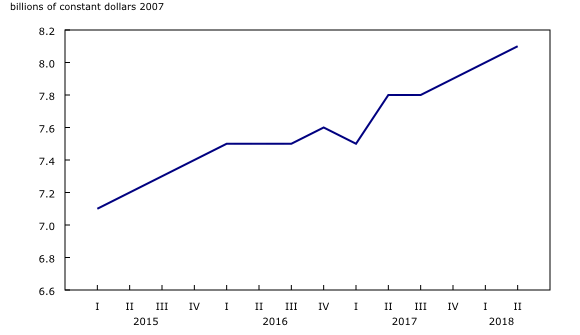 Canadian household expenditures on cannabis (for medical and non-medical use) increased 1.2% in the second quarter, following a 1.4% increase in the first quarter. Household expenditures on cannabis have been increasing steadily since the first quarter of 2015, rising at an average rate of 1.0% per quarter. Consumption has risen 72% since the first quarter of 2001, when the Canadian government first passed legislation legalizing the consumption of cannabis for medical purposes. In nominal terms, on an annualized basis, Canadians spent $5.7 billion on cannabis products in the second quarter. Of this, 84.8% or $4.8 billion was purchased illegally for non-medical use. This proportion has fallen from 98.0% in the second quarter of 2014, reflecting increases in cannabis consumption for medical use. 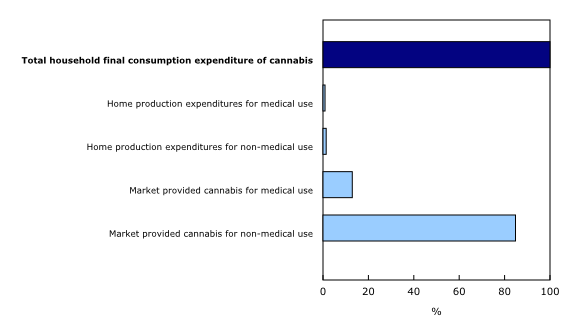 Expenditures on cannabis for medical purposes reached $784 million, accounting for 13.8% of total expenditures. This includes $52 million of personal production of cannabis for medical use. This second quarter share represents a slight increase over the 12.7% share in the first quarter, reflecting the increased availability of cannabis for medical use. Cannabis consumption for medical use has more than tripled since the second quarter of 2016. The average combined medical and non-medical reported price for cannabis was $6.74/gram in the second quarter, with cannabis for medical use being slightly higher than the price of cannabis for non-medical use. Prices for both medical and non-medical cannabis have fallen significantly over the past few years, declining by 10.6% since the first quarter of 2016. These data represents an extension of the Cannabis Economic Account, 1961 to 2017, which can be found on the Cannabis Stats Hub. Estimates for the first and second quarter were derived from a variety of sources including the StatsCannabis Crowdsourcing Application, the National Cannabis Survey and Health Canada administrative data. Own use consumption is defined as cannabis grown by households for their own use for either medical or non-medical purposes. Quarterly estimates are seasonally adjusted, expressed at an annual rate.